Chana Masala is a delicious side dish which goes on well with Bhature, Poori, Butter Naan and the list goes on and on. It is basically a Punjabi dish which is very easy to prepare. This dish is prepared by boiling Channa and mixing it up with some spicy Masala. The recipe goes as follows. How To Prepare Chana Masala. This dish requires around 45 minutes to prepare and the ingredient mentioned here is enough for three servings. Kabuli channa ( white chick peas) - 1 cup. Tea leaves or tea bag - 1 tsp. Chana Masala Powder - 1 tsp. Jeera ( cumin seeds) - 1 tsp. Coriander leaves - 4 sprigs. Amchur ( Dry Mango ) Powder - 1/2 tsp. Method To Make Chana Masala. Wash chana and boil it in pressure cooker along with soda and tea leaves up till 5 whistles. Later on, discard the tea leaves. Meanwhile heat a pan with oil in it. Add jeera ( cumin seeds ), coriander leaves, red chilli and saute for a couple of seconds. Set it aside on a plate. Now, add 3 tsp of oil to the pan and fry the onions for a few minutes till it changes its color. Take a mixer jar, add all the fried items.ginger, garlic and 1 tbsp of boiled chana and run the mixer jar till it is smoothly blended. Now heat another pan with 2 tbsp of oil in it . Add chopped tomatoes and salt in it. Let the tomatoes get mashed up and then, add the ground items and green chilis to it. Mix in all the powders like red chilli powder, amchur powder, and chana Masala powder into it. Garnish with 1 chopped onion and coriander leaves while serving. 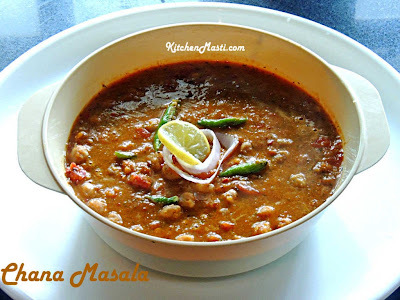 Your spicy and tasty Chana Masala is ready to be served.!!! Instead of amchur powder, you can add 1 tsp of lemon juice. You can omit green chilli if you opt for a less spicier food. You can add anaardhana powder for a unique taste.